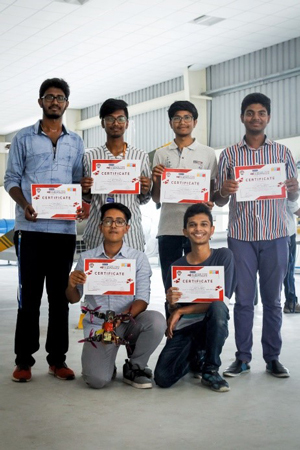 IIAEM Jain (Deemed-to-be University)'s B.Tech Aerospace Engineering students bagged 6 prizes in the prestigious National Level Drone event held in BITS Pilani as a part of APOGEE event from 28 to 31 March 2019. A group of students of IIAEM Jain (Deemed-to-be University) travelled to Birla Institute of Technology and Science, Pilani and bagged 6 prizes. 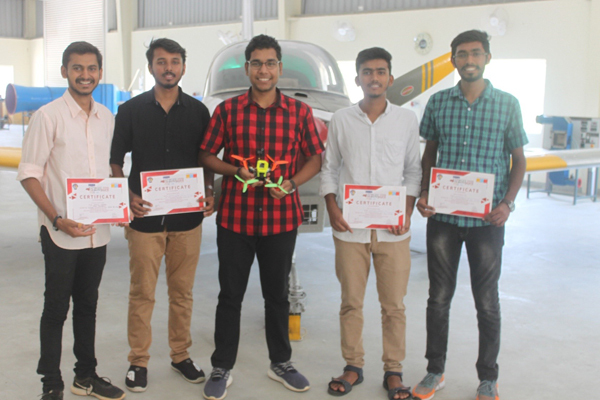 The students won 1st, 2nd and 3rd prizes in the prestigious National Level Drone event held in BITS Pilani as a part of APOGEE event during 28th to 31st March 2019. Team Pegasus bagged first prize by completing the “Path of 20 meters race” associated with the hurdles and various tasks in the shortest time. The team had a professional pilot and drone was equipped with camera. Team Black Hawk secured second place in the “Drone race” by its great piloting skills and gave a stiff competition to team Pegasus. 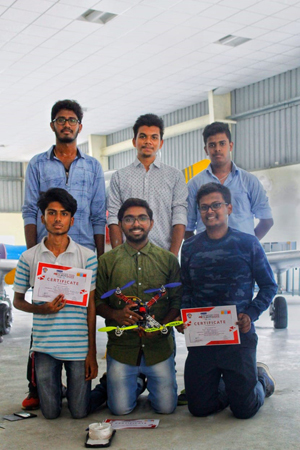 Team Maaruthsakha bagged third prize in both “Drone race and Hovercraft race”. The drone was equipped with precise QR code scanning mechanism and luggage dropping mechanism which were its highlights. The speciality of hovercraft was its 3D printed parts. Entire structural components of the hovercraft were indigenously designed and 3D printed. Team Dhruv won second prize in Air-borne event held at BITS Pilani which was a “Hovercraft race”. The model has successfully completed a track race in a path of hurdles including water. 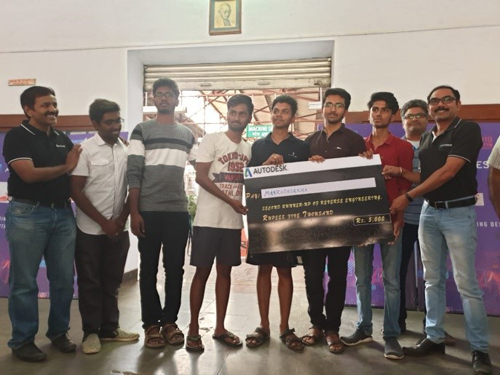 Team Maaruthsakha won 3rd prize in “Reverse Engineering” competition in which they dismantled a 4 stroke IC engine, designed CAD models of all the parts inside along with a few machining simulations, G- Codes and finally assembled the engine within the allotted time. Delegates from AUTODESK were glad to honour them with the incentives.